As Nephi introduces himself, he explains that he writes using “the learning of the Jews and the language of the Egyptians,” and Moroni later describes this as “reformed Egyptian” (Mormon 9:32–34). What might be the “reformed Egyptian” or “the learning of the Jews and the language of the Egyptians” employed by Nephi? Substantial evidence suggests that some ancient Israelites used Egyptian writing with Hebrew influences. Here are seven clues. Finally, and most significantly, Calabro explains that one inscription from the Sinai is “the first example of hieratic unilateral signs in [eighth and seventh century BC] Judah.”11 Taken together, the evidence “indicates a widespread presence of scribes educated in this Judahite variety of Egyptian script.”12 Perhaps this is the “learning of the Jews and the language of the Egyptians” referred to by Nephi the scribe/prophet. Despite rampant “Egypt-o-mania” in the early nineteenth century, the notion of Jews writing in Egyptian was an unimaginable concept,13 and Joseph Smith was roundly criticized on this point by early Book of Mormon critics.14 In this respect, the Book of Mormon has aged better than its detractors. Second, as noted above, Calabro’s analysis pointing to a long standing scribal tradition teaching a “Judahite variety” of Egyptian writing dovetails nicely with Nephi’s statement about “the learning of the Jews and the language of the Egyptians” (1 Nephi 1:2). John S. Thompson, “Lehi and Egypt,” in Glimpses of Lehi’s Jerusalem, ed. John W. Welch, David Rolph Seely, and Jo Ann H. Seely (Provo, UT: FARMS, 2004), 259–276. John A. Tvedtnes and Stephen D. Ricks, “Jewish and Other Semitic Texts Written in Egyptian Characters,” Journal of Book of Mormon Studies 5/2 (1996): 156–163; reprinted as “Semitic Texts Written in Egyptian Characters,” in Pressing Forward with the Book of Mormon, ed. John W. Welch and Melvin J. Thorne (Provo, UT: FARMS, 1999), 237–243. 2. Stefan Wimmer, Palästiniches Hieratisch: Die Zahl- und Sonderzeichen in der althebräishen Schrift (Wiesbaden: Harraossowitz, 2008), 20. 3. John A. Tvedtnes and Stephen D. Ricks, “Jewish and Other Semitic Texts Written in Egyptian Characters,” Journal of Book of Mormon Studies 5/2 (1996): 156–163; reprinted as “Semitic Texts Written in Egyptian Characters,” in Pressing Forward with the Book of Mormon, ed. John W. Welch and Melvin J. Thorne (Provo, UT: FARMS, 1999), 237–243. 4. 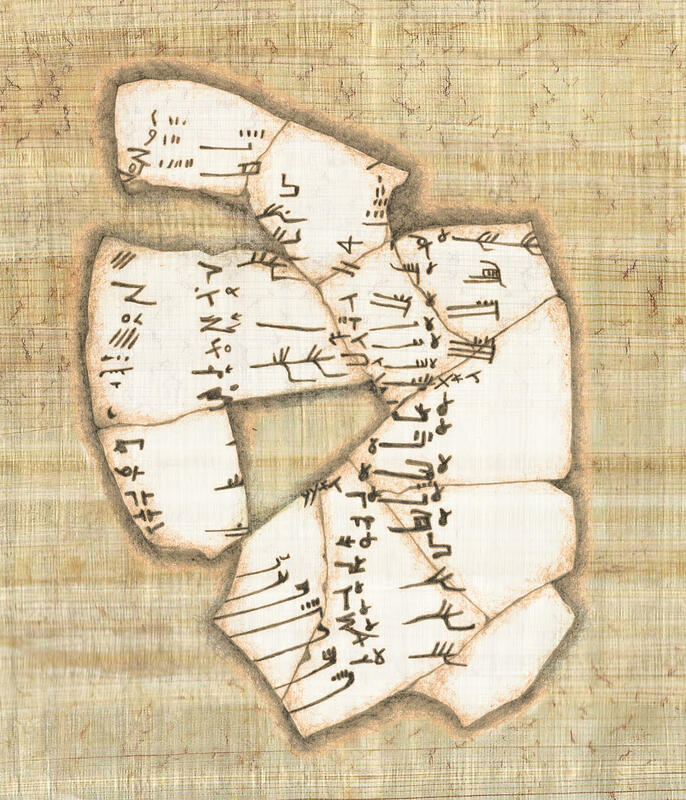 Tvedtnes and Ricks, “Semitic Texts Written in Egyptian Characters,” in Pressing Forward, 238: “a number of northwest Semitic texts are included in Egyptian magical papyri. These are mostly incantations that, instead of being translated from the original Semitic language into Egyptian, were merely transcribed in Egyptian hieratic.” The texts in question were written with what Albright termed the “Egyptian Syllabic Orthography,” using standard Egyptian symbols in combinations designed to transliterate Semitic words. In some cases, whole Semitic texts were written in Egyptian script. See Wolfgang Helck, “Asiatische Fremdworte im Ägyptischen,” in Die Beziehungen Ägyptens zu Vorderasien im 3. und 2. Jahrtausend v. Chr., 2nd ed. (Wiesbaden: Harrassowitz, 1971), 528–29. 5. Tvedtnes and Ricks, “Semitic Texts,” 239. They comment, “For years, Egyptologists struggled with the text but could make no sense of it. The letters were clear, but they did not form intelligible words in Egyptian. In 1944, Raymond Bowman of the University of Chicago realized that, while the script is Egyptian, the underlying language is Aramaic. … Here, then, we have a Bible passage, in its Aramaic translation, written in late Egyptian characters.” They reference Raymond A. Bowman, “An Aramaic Religious Text in Demotic Script,” Journal of Near Eastern Studies 3 (1944): 219–31. 6. Tvedtnes and Ricks, “Semitic Texts,” 239. 8. David Calabro, “The Hieratic Scribal Tradition in Preexilic Judah,” in Evolving Egypt: Innovation, Appropriation, and Reinterpretation in Ancient Egypt, BAR International Series 2397, ed. Kerry Muhlestein and John Gee (Oxford, Eng. : Archaeopress, 2012), 77. 9. Calabro, “The Hieratic Scribal Tradition,” 79. 10. Calabro, “The Hieratic Scribal Tradition,” 78. 11. Calabro, “The Hieratic Scribal Tradition,” 81. 12. Calabro, “The Hieratic Scribal Tradition,” 83. 13. A search of Rick Grunder’s comprehensive Mormon Parallels: A Bibliographic Source (LaFayette, NY: Rick Grunder – Books, 2008) turns up five sources (on pp. 268, 270, 628, 774–775, and 1612) which he suggests could be the source of this idea. Two of these (pp. 628, 774–775) simply talk about Moses learning Egyptian while in Egypt, and the other three all describe a concept of prophetic writing (such as the Book of Revelation) being “hieroglyphic” in the sense of being highly “symbolic.” Yet, the writings of the Book of Mormon are strikingly lacking in the sorts of highly symbolic prophecies usually associated with this concept. 15. John S. Thompson, “Lehi and Egypt,” in Glimpses of Lehi’s Jerusalem, ed. John W. Welch, David Rolph Seely, and Jo Ann H. Seely (Provo, UT: FARMS, 2004), 266–267; see also and Aaron P. Schade, “The Kingdom of Judah: Politics, Prophets, and Scribes in the Late Preexilic Period,” also in Glimpses of Lehi’s Jerusalem, 315–319. 16. Neal Rappleye, “Learning Nephi’s Language: Creating a Context for 1 Nephi 1:2,” Interpreter: A Journal of Mormon Scripture 16 (2015): 151–159. 17. Tvedtnes and Ricks, “Semitic Texts,” 241.